They say necessity is the mother of invention, and although I strongly believe in the difference between need and want, I would argue that desire is a close relative of invention as well. For example, this morning I came downstairs to find five ripe bananas in the banana bowl. Usually, there are few (if any) bananas around here because they get eaten so quickly. The brown-speckled specimens weren’t bad just yet, but they were past the point of pleasurable eating-out-of-hand. I needed to use up these bananas, but I didn’t want to make banana bread. Make no mistake, I love banana bread. Warm, dense banana bread strewn with walnuts is one of the best snacks known to man. But ripe bananas are not a one trick pony and I knew they would be lovely in a yogurt cake. 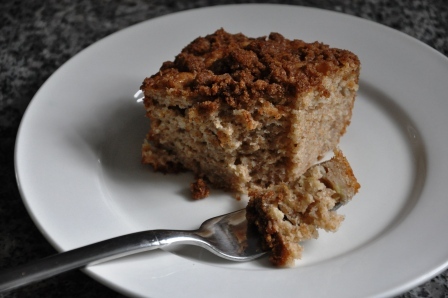 Banana yogurt cake topped with a nubbly, cinnamon-scented brown sugar/whole wheat streusel. Yes. This I wanted. This cake is like a cross between banana bread, French yogurt cake, and coffee cake. It has a rich banana aroma, moist crumb (from the yogurt and banana, not from butter!) and­-the pièce de résistance-buttery (yes, from real butter! 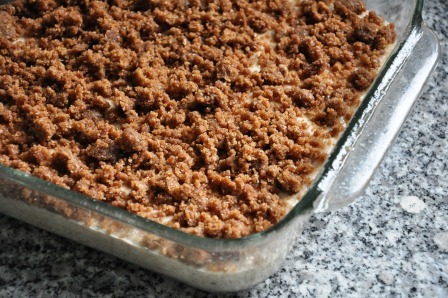 ), caramel-y, streusel topping. And while no excuse is necessary to make this cake, it would be perfect for a sunny (or drizzly in Seattle) brunch, special after-school snack, or homey dessert. Preheat the oven to 350° F. Grease a 9-inch square baking dish with nonstick cooking spray, butter or oil. 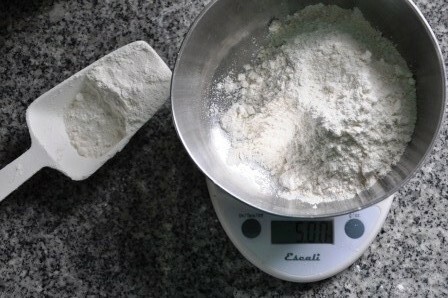 In a medium bowl, whisk together the flours, baking powder and soda, and salt; set aside. 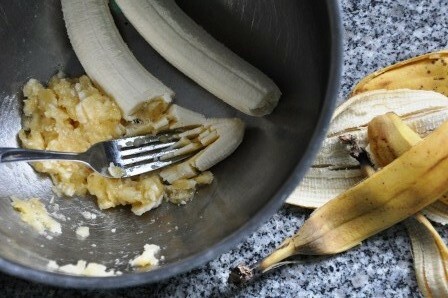 In a large bowl, mash the bananas until smooth then whisk in the yogurt, sugar, egg, vegetable oil and vanilla. Make the batter. Pour the dry ingredients onto the wet, along with the milk. Gently fold the batter with a spatula until the ingredients are just combined (do not over mix!). Pour the batter into the prepared dish and set aside. Make the streusel. Whisk together the flour, sugar and cinnamon, then drizzle in the melted butter and mix to combine. Sprinkle the streusel evenly over the cake batter. Bake the cake. Place the cake on the middle rack in the center of the oven and bake for 45 minutes or until a toothpick comes out clean. Cool for at least 15 minutes on a wire rack before eating. It is best eaten the day of, but keeps for up to three days covered with plastic wrap at room temperature. This was a delicious recipe! It was even good with two large bananas(not quite the 3 the recipe calls for). I appreciate the whole wheat flour, too. Thanks Blythe! Glad you enjoyed the recipe. I’m totally making this for my mom for Mother’s Day tomorrow! perfect cause I had all the ingredients already:) Thanks for rocking at recipes!